Some time ago, climate activists noticed they were not winning over the American public, whose opinion was deeply divided on global warming/climate change. They turned to legal venues to promote their agenda, including shareholder proposals and legal complaints. Any jurisdiction, like Massachusetts or the UK, who enacted reductions of fossil fuel emissions will be subject to legal suits for not achieving emission targets. In such court proceedings, global warming/climate change, temperature changes, extreme weather etc. are all of them beside the point. Once such a law is in place, the belief has served only as a cover to compel energy policies no longer needing any reference to climate science or its uncertainties. Washington state is one of the most liberal in the US, and thus a hotbed of climate alarm and activism. In the November general election, the state was the first to vote on imposing a carbon tax. The measure was defeated, but only because social justice groups and many environmental activists argued it did not go far enough in promoting clean energy. In this context, we have a brave judge standing up for the rule of law in a case of civil disobedience. The defendant Ken Ward is an Oregon-based environmental activist who turned off an oil pipeline in Washington state last October 11. He does not dispute his criminal behavior, but claims his actions were necessary to defend the planet. The 60-year-old Corbett, Ore. man faces three felony charges and one misdemeanor for shutting off a valve on the Trans Mountain Pipeline in Burlington, Wash, which transports Canadian Tar Sands crude oil into the state for refinement. At a pre-trial hearing on January 24 in Skagit County, Washington, a judge denied Ward’s defense strategy, known as the necessity defense. Interestingly, only the report in The Guardian (here) quoted Judge Rickert so that readers might hear what he said (the news). But the journalist’s bias came out in several adjectives and parenthetical asides intended to assert his own opinion (fake news) to undermine the judge’s authority. Finally a judge stands up for the rule of law. No religious belief, be it Seventh Day Adventism, or Catastrophic Climatism can be imposed on others, nor be a justification for illegal actions against lawful enterprises. At least the Adventists respect social justice by seeking only to persuade others through discussion rather than by force or violence. A year ago was another loss in the courts for climate activists on January 15, 2016 in Seattle. The ‘Delta 5’ had attempted to illegally block trains carrying crude oil near Seattle, and had hoped that their trial would mark the first time that a US jury was allowed to consider the “necessity defense” in a case of climate activism. That’s two brave judges. It appears many more courageous judges will be needed. 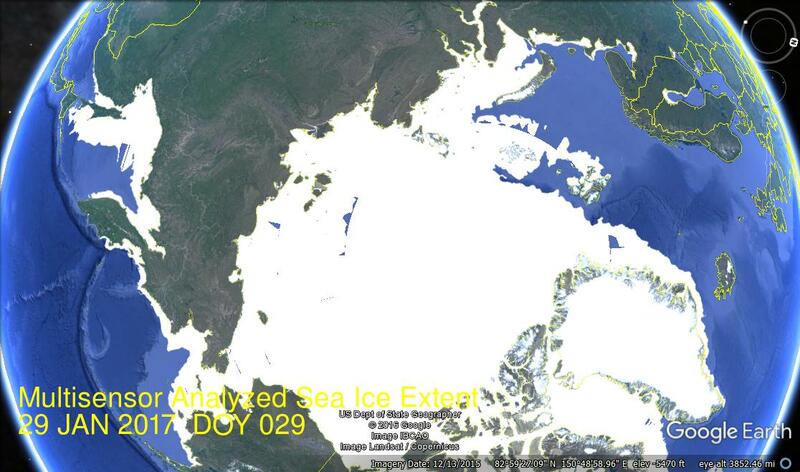 Sea Ice Index (SII) from NOAA is based on 25 km cells and 15% ice coverage. That means if a grid cell 25X25, or 625 km2 is estimated to have at least 15% ice, then 625 km2 is added to the total extent. In the mapping details, grid cells vary between 382 to 664 km2 with latitudes. And the satellites’ Field of View (FOV) is actually an ellipsoid ranging from 486 to 3330 km2 depending on the channel and frequency. More info is here. MASIE is based on 4 km cells and 40% ice coverage. Thus, for MASIE estimates, if a grid cell is deemed to have at least 40% ice, then 16 km2 is added to the total extent. The significantly higher resolution in MASIE means that any error in detecting ice cover at the threshold level affects only 16 km2 in the MASIE total, compared to at least 600 km2 variation in SII. A few dozen SII cells falling below the 15% threshold is reported as a sizable loss of ice in the Arctic. MASIE is an operational ice product developed from multiple sources to provide the most accurate possible description of Arctic ice for the sake of ships operating in the region. Operational analyses combine a variety of remote-sensing inputs and other sources via manual integration to create high-resolution, accurate charts of ice conditions in support of navigation and operational forecast models. One such product is the daily Multisensor Analyzed Sea Ice Extent (MASIE). The higher spatial resolution along with multiple input data and manual analysis potentially provide more precise mapping of the ice edge than passive microwave estimates. From Meier et al., link below. Use the Sea Ice Index when comparing trends in sea ice over time or when consistency is important. Even then, the monthly, not the daily, Sea Ice Index views should be used to look at trends in sea ice. The Sea Ice Index documentation explains how linear regression is used to say something about trends in ice extent, and what the limitations of that method are. Use MASIE when you want the most accurate view possible of Arctic-wide ice on a given day or through the week. The fact that MASIE employs human judgment is discomforting to climatologists as a potential source of error, so Meier and others prefer that the analysis be done by computer algorithms. Yet, as we shall see, the computer programs are themselves human inventions and when applied uncritically by machines produce errors of their own. 3. MASIE serves as Calibration for satellite products. The differences are even greater for Canadian regions. Our comparison is not meant to be an extensive validation of either product, but to illustrate as guidance for future use how the two products behave in different regimes. Comparisons indicate that MASIE shows higher Arctic-wide extent values throughout most of the year, largely because of the limitations of passive microwave sensors in some conditions (e.g. surface melt). However, during some parts of the year, MASIE tends to indicate less ice than estimated by passive microwave sensors. These comparisons yield a better understanding of operational and research sea-ice data products; this in turn has important implications for their use in climate and weather models. A more extensive comparison of MASIE from NIC and SII from NOAA is here. 4. MASIE continues a long history of Arctic Ice Charts. Since these long-term records show a quasi-60 year cycle in ice extents, it is vital to have a modern dataset based on the same methodology, albeit with sophisticated modern tools. Measuring anything in the Arctic is difficult, and especially sea ice that is constantly moving around. It is a good thing to have independent measures using different methodologies, since any estimate is prone to error. Please take the time to express your appreciation for NIC’s contribution and your support for their products at MASIE home page. In the comments Neven said MASIE was unusable because it was biased low before 2010 and high afterward. I have looked into that and he is mistaken. Below is the pattern that is observed most months. March is the annual maximum and coming up soon. As the graph shows, the two datasets were aligned through 2010, and then SII began underestimating ice extent, resulting in a negative 11-year trend. MASIE shows the same fluctuations, but with higher extents and a slightly positive trend for March extents. The satellite sensors have a hard time with mixed ice/water conditions (well-documented). 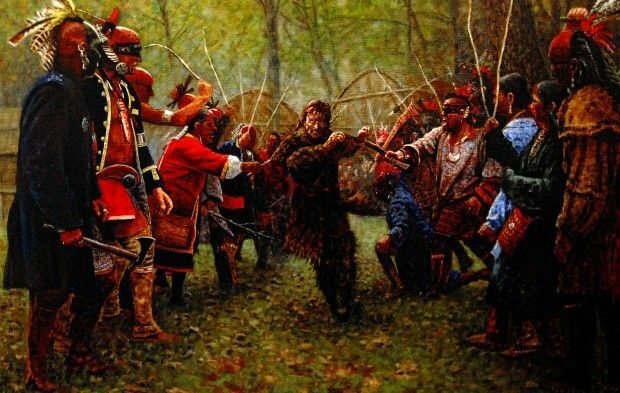 Several Native American tribes of the Eastern Woodlands culture forced prisoners to run the gauntlet (notables included Daniel Boone). Forced to run between two rows of people repeatedly striking him, the runner could only survive by taking the blows while moving forward and avoiding a stumble. No mercy is shown to one who loses his footing and falls to the ground. Currently US Senators are putting Scott Pruitt through their gauntlet, called the Confirmation Hearing for the Nominated Director of the EPA. Pruitt recently provided 242 pages of written responses to hundreds of questions from senators. Below are extracted many of the substantial questions and answers regarding climate change. The interchanges reveal the preoccupations of climate activists and the contrasting worldviews of climate alarmists and skeptics. In the text below, the question number comes from a particular senator’s list, the answer paragraph is Scott Pruitt’s response. (Many questions were not specific to climate change per se.) I have bolded some notable themes and put some key statements into italics. 3. Climate change is one of the most pressing issues currently facing the planet. Rising sea levels and extreme weather are currently threatening the safety and security of my constituents in New Jersey. Lower income and vulnerable communities are disproportionately impacted by the extreme heat and flooding events that are becoming more common and more severe. Given the immediate and increasing threat to my constituents and to people everywhere, what is your plan to address climate change? If confirmed, I will work to achieve the objectives of EPA-administered laws consistent with the process and framework established by Congress. I will work closely with the states in establishing and implementing regulatory standards to ensure a meaningful and effective advancement of these objectives. 31.What is your understanding of the role of climate change in algal blooms? EPA identifies the following as causes of harmful algal blooms: sunlight, slow-moving water, and excess nutrients. For climate change to have a role, it would first have to have an impact on one of these three causes. 74.How does your position that EPA should ostensibly recuse itself from State Department responsibilities and engagements on the Paris Agreement comport with any plans that you, as the next EPA administrator, may execute to rescind or alter domestic policies that affect the US National Determined Contribution (NDC) to the Paris Agreement? As I stated in a previous answer, should the State Department decide to continue to participate in the Paris Agreement and if I am confirmed as Administrator, I will work with all involved agencies to ensure that commitments made on behalf of the United States are achievable and consistent with requisite legal authorities delegated by Congress. 75.Recently at the World Economic Forum in Davos, Switzerland, Chinese President Xi Jinping expressed China’s great interest in being the world’s leader on a number of issues including action to address climate change. Do you believe it is the U.S.’s national interest to cede leadership to the Chinese on global action to address climate change? It is the mission of the State Department to advance our national interests within the realm of foreign policy. If confirmed, I will work to advance the mission of the EPA, which is to protect human health and the environment, consistent with the State Department’s strategy for international engagement on climate change. 76.Do you believe climate change is a real and serious threat to the planet? The climate is changing and human activity impacts our changing climate in some manner. The ability to measure with precision the degree and extent of that impact, and what to do about it, are subject to continuing debate and dialogue. 77.Do you accept the scientific consensus that should average global temperatures reach or exceed +2 degrees Celsius that many regions of the world will very likely experience catastrophic changes in the environment that may very likely impact the safety and prosperity of many people? Do you believe that uncertainty in climate science warrants greater study before the U.S. takes significant action to reduce greenhouse gas pollution? If so, are you aware that the portion of the scientific community that claims there is uncertainty in the science is limited to limited to about 5% of climate science communities? If you believe that the very small portion of the world’s climate science community who hold outlier opinions on the severity of climate change justifies inaction, why wouldn’t you give similar credence to other outlying opinions in the climate science community that hold that global average temperatures may exceed 10 degrees Celsius and that catastrophic events may occur as soon as five or ten years? The climate is changing and human activity impacts our changing climate in some manner. The ability to measure with precision the degree and extent of that impact, and what to do about it, are subject to continuing debate and dialogue. If confirmed, I will work to ensure that any regulatory actions are based on the most up to date and objective scientific data. 78.Our ability to predict the weather has improved dramatically over the last 20 years with the advent of supercomputers, new satellite monitoring options, and vastly superior atmospheric models. But still floods, droughts, hurricanes and similar phenomena occur and cause damage with sometimes only limited warning. What precision of prediction do you require before you are willing to accept the scientific community’s overwhelming consensus that unchecked increases in greenhouse gas emissions will very likely have catastrophic effects, many of which the National Climate Assessment has described in detail every 4 years since 1990? The ability to measure with precision the degree and extent of human activity on our changing climate, and what to do about it, are subject to continuing debate and dialogue. If confirmed, I will work to ensure that any regulatory actions are based on the most up to date and objective scientific data. 80.What would have to change about our ability to predict the effect of increasing greenhouse gas emissions in Earth’s atmosphere for you to consider it adequate? If confirmed, I will work to ensure that any regulatory actions are based on the most up to date and objective scientific data, including the ever-evolving understanding of the impact increasing greenhouse gases have on our changing climate. 87.Do you trust the analysis, concerns and recommendations of security experts at the State Department, Department of Defense, Central Intelligence Agency, The Navy War College, UN Security Council, and the World Bank, who have expressed growing concerns over the threat climate change poses to national and global security? I have no reason to disagree with the statements from the listed security experts, although I have not made any attempt to independently verify their accuracy. 15.Mr. Pruitt, my State of Delaware is already seeing the adverse effects of climate change with sea level rise, ocean acidification, and stronger storms. While all states will be harmed by climate change, the adverse effects will vary by state and region. Can you comment on why it is imperative that we have national standards for the reduction in carbon pollution? If confirmed, I will fulfill the duties of the Administrator consistent with Massachusetts v. EPA and the agency’s Endangerment Finding on Greenhouse Gases respective of the relative statutory framework established by Congress. 60.As you are well aware, on April 2, 2007, in Massachusetts v. EPA, 549 U.S. 497 (2007), the Supreme Court determined that sufficient information existed then for EPA to make an endangerment finding with respect to the combined emissions of six greenhouse gases from new motor vehicles and new motor vehicle engines under CAA section 202(a). On December 7, 2009, the Administrator determined that those gases/sources contribute to greenhouse gas pollution that endangers public health and welfare. How do you plan to execute your legal authority to protect the public health and welfare from greenhouse gas pollution? The Supreme Court held that GHGs are an air pollutant under the Clean Air Act. It did not address the question of whether regulation of GHGs under the Clean Air Act is warranted. In the subsequent UARG decision, the Supreme Court cautioned EPA that there are significant limits on EPA’s authority to regulate GHGs under the Clean Air Act. The unprecedented Supreme Court stay of EPA’s so-called “Clean Power Plan” was predicated upon a finding that the plaintiffs in the case were likely to prevail on the merits. In light of these holdings, I will hew closely to the text and intent of the Clean Air Act when considering further regulation of GHGs under that law if confirmed as Administrator. 63.As you know, the Renewable Fuels Standard, as amended by Congress in 2007, requires the blending of 36 billion gallons of renewable fuel into conventional gasoline and diesel by 2022. In order to add that many renewable fuel gallons to our fuel supply, do you agree that EPA must approve the sale of fuels blended with greater than 10-percent renewable content? While Congress included “applicable volume” levels in the RFS statute, Congress also took care to expressly authorize the EPA Administrator to reduce volumetric requirements below the statute’s default levels in light of real-world conditions from year to year. Specifically, the Administrator may waive the statute’s volume requirements if he determines “that implementation of the requirement would severely harm the economy or environment of a State, a region, or the United States, or “that there is an inadequate domestic supply.” The EPA already has granted such waivers based on real-world conditions in recent years and, if confirmed, I would take care to administer the statute in accordance with the statutory objectives. While no statute mandates the sale of fuels blended with greater than 10 percent renewable content, statutes do vest the Administrator with discretion to authorize a variety of fuel blends. 132.Do you agree with this statement from NASA: “97 percent or more of actively publishing climate scientists agree: Climate-warming trends over the past century are extremely likely due to human activities.” If not, please explain why you do not agree. I have no reason to disagree with NASA’s statement, although I have not made any attempt to independently verify its accuracy. 37.What is the scientific basis for sea level rise, which we have experienced along the coast of New York State? If confirmed as Administrator, I will work to ensure EPA regulatory actions are based on the most up to date and objective scientific data, including the ever-evolving understanding of the changes in our climate and sea level rise. 38.Do you agree with the National Climate Assessment that human-induced climate change has already increased the number and strength of extreme weather events? I am aware of the broad range of views within the scientific community regarding the relationship between human activity on changes in the climate and any resulting impact on extreme weather events. If confirmed as Administrator, I will work to ensure EPA regulatory actions are based on the most up to date and objective scientific data. 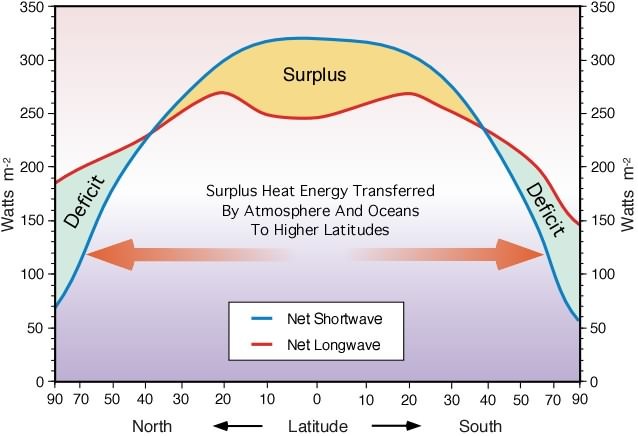 23.The greenhouse gas effect traps outgoing longwave radiation causing a radiative imbalance of Earth, ultimately leading to the warming of the globe. The fundamental physics of climate change are well settled. Are you aware of the theory of radiative balance of the Earth? Can you briefly describe it? Do you understand Planck’s law and the difference between shortwave vs. longwave radiation, and how that relates to Earth’s energy balance? 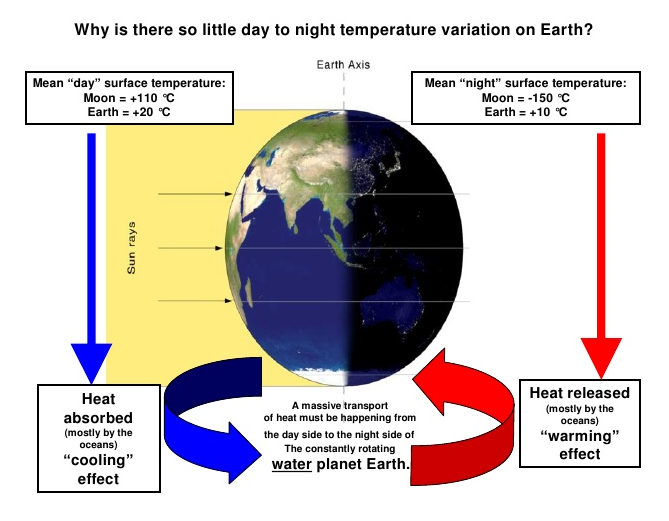 Do you agree that disturbances to this equilibrium can warm or cool the Earth? Are you aware of the atmospheric circulation and oceanic currents that transport heat from the Equator to the poles? 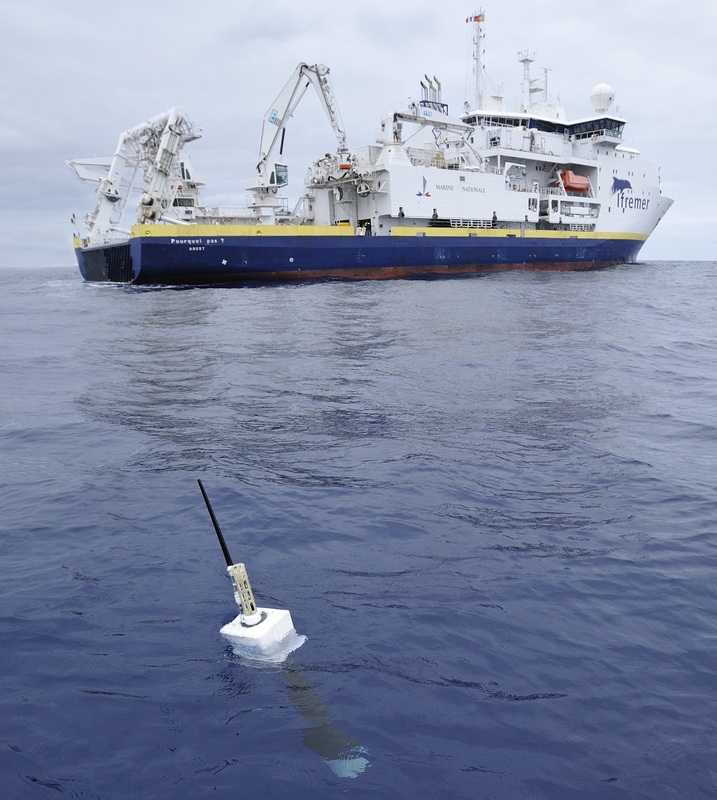 Due to the complexity of the climate system, there are lag times between changes in certain conditions, such as the amount of carbon dioxide in the atmosphere, and other observable changes, such as the temperature of the deep ocean. If an action by the United States or world today, could positively or negative benefit the future, say 50 to 100 years down the road, is that an important consideration? Are you aware that there is less ice on land in such places as Antarctica and Greenland than in previous years since the Industrial Revolution? What do you believe is causing this decrease in mass of ice on land? To where do you believe the water from ice melt on land goes, and do you believe that could cause global sea levels to rise? Do you disagree that additional greenhouse gases in Earth’s atmosphere, such as carbon dioxide, will cause a smaller magnitude outgoing longwave radiation to escape to space? Please explain. Do you disagree that the burning of fossil fuels, such as oil or natural gas, cause carbon dioxide to be released into the atmosphere? Please explain. Do you disagree that if fossil fuels were not extracted and burned, less carbon dioxide would be released into the atmosphere? Please explain. Therefore, is it possible, if not probable, that humans releasing greenhouse gases into the atmosphere could cause more heat to be trapped by the atmosphere? Please explain. Do you understand that the concept address is the previous question is the basis of human-caused climate change? Please explain. If not human burning of fossil fuels, how do you explain the observed increase in carbon dioxide in atmosphere? What is a safe level of carbon dioxide in the atmosphere? Please provide this number in parts per million. Please explain. If states want to individually take measures to curb greenhouse gas emissions will you allow them to do so? If yes, how will you support them? If not, why does the EPA have the authority to stop a state from implementing measures to curb greenhouse gases? If confirmed, I will work to ensure that any regulatory actions are based on the most up to date and objective scientific data, including the ever-evolving understanding of the impact increasing greenhouse gases have on our changing climate. I will also adhere to the applicable statutory authorities to fulfill EPA’s mission to protect human health and the environment consistent with the process and rule of law established by congress. I also believe the Administrator has an important role when it comes to the regulation of carbon dioxide, which I will fulfill consistent with Massachusetts v. EPA and the agency’s Endangerment Finding on Greenhouse Gases respective of the applicable statutory framework established by Congress. I believe the most effective path towards achieving these objectives is through close partnership with the states granting them regulatory leeway as ascribed by the rule of law. 11.There are many groups within the Christian community — and groups from other faiths — in the United States who agree with the overwhelming scientific consensus that climate change is a danger to our country, and who strongly support taking action to mitigate the causes and impacts of climate change. For example, the Southern Baptist Convention made a statement in 2007 saying that Christians are responsible for caring for creation, and emphasized the importance of acting to prevent climate change. The President of the Southern Baptist Theological Seminary, has also issued a statement echoing these views. As EPA Administrator, would you share the view that, in the interest of caring for creation, that action should be taken to prevent climate change? I believe we can grow our economy, harvest the resources God has blessed us with, while also being good stewards of the air, land, and water by which we have been favored. If confirmed, I will work to advance the mission of EPA to protect human health and the environment within the framework established by Congress. 13. 97% of publishing climate scientists support the idea the climate change is real and man-made. You are an attorney, but have questioned the reality of climate change. Do you currently agree that climate change is real and manmade? If not do you believe the 97% of climate scientists that do hold that view are wrong, or lying? The ability to measure with precision the degree and extent of human activity on our changing climate, and what to do about it, are subject to continuing debate and dialogue. If confirmed, I will make sure the agency’s regulatory actions are based on the most up to date and objective scientific data. 14.What scientific organizations do you personally trust when it comes to the science of climate change? Please explain why you trust any organization(s) you list. If confirmed as EPA Administrator, I will adhere to the applicable statutory authorities to fulfill EPA’s mission to protect human health and the environment and will base my decisions on sound science, including advice provided by agency experts and advisory personnel. There is a diverse range of views regarding the key drivers of our changing climate among scientists. I believe that these differences should be the subject of robust and open debate free from intimidation. If confirmed, I will continue to encourage an honest debate on our changing climate, the role of human activity, our ability to measure the degree and extent of human activity, and what to do about it. If confirmed, I will work to ensure that any regulatory actions are based on the most up to date and objective scientific data. I will also adhere to the applicable statutory authorities to fulfill EPA’s mission to protect human health and the environment consistent with the process and rule of law established by congress. 16.Are you aware that each of the past three decades has been warmer than the one before, and warmer than all the previous decades since record keeping began in the 1880s? This trend is based on actual temperature measurements. Do you believe that there is uncertainty in this warming trend that has been directly measured? If so, please explain. I am aware of a diverse range of conclusions regarding global temperatures, including that over the past two decades satellite data indicates there has been a leveling off of warming, which some scientists refer to as the “hiatus.” I am also aware that the discrepancy between land-based temperature stations and satellite temperature stations can be attributed to expansive urbanization within in our country where artificial substances such as asphalt can interfere with the accuracy of land-based temperature stations and that the agencies charged with keeping the data do not accurately account for this type of interference. I am also aware that ‘warmest year ever’ claims from NASA and NOAA are based on minimal temperature differences that fall within the margin of error. Finally, I am aware that temperatures have been changing for millions of years that predate the relatively short modern record keeping efforts that began in 1880. 17.Is there a scientific basis, based on the best available science and the weight of scientific evidence, for revoking or revising the finding that greenhouse gases endanger public health and welfare? To my knowledge, there is nothing currently pending before the EPA that would require I take any additional actions on the Endangerment Finding on Greenhouse Gases and if there were, it would not be wise to prejudge the outcome. 39.The 2014 U.S. National Climate Assessment concludes that climate change will impact every community in the United States, and that low-income communities and communities of color will be the hardest hit. These vulnerable communities will feel the impacts of climate change more severely due to lower quality housing, which is often less equipped to safely weather severe storms, severe heat, and freezing temperatures. How will you work to reduce climate change risks in low-income communities and communities of color? I believe environmental justice for low-income and minority communities is an important role of the EPA Administrator. If confirmed, I will adhere to the applicable statutory authorities to fulfill EPA’s mission to protect human health and the environment for all of our nation’s citizens. 12.As Administrator, will you recognize the findings of the U.S. Climate Change Science Program/U.S. Global Change Research Program and the National Research Council of the U.S. National Academy of Sciences on the science of climate change, including its anthropogenic causes? 14.Do you support the Paris Climate Agreement? The role of the United States in the Paris Agreement is a State Department matter. If confirmed, I will work to advance the mission of the EPA, which is to protect human health and the environment, consistent with the State Department’s strategy for international engagement on climate change. 15.What are your plans for implementing the Paris Climate Agreement? Should the government decide to continue to participate in the Paris Agreement and if I am confirmed as Administrator, I will collaborate with all involved agencies to ensure that commitments made on behalf of the United States are achievable and consistent with requisite legal authorities delegated by Congress. 16.You have written that the climate change “… debate is far from settled. Scientists continue to disagree about the degree and extent of global warming and its connection to the actions of mankind.” What would it take for you to admit that all three of these allegations are incorrect? 18.If Harold Hamm told you he was no longer a climate change denier, would you believe him? 19.President Elect Trump’s Secretary of State nominee, Rex Tillerson, is no longer a climate change denier. Why do you disagree with Tillerson? There is a diverse range of views regarding the key drivers of our changing climate among scientists, policy-makers and President Trump’s nominees. I believe that these differences should be the subject of robust and open debate free from intimidation. If confirmed, I will continue to encourage an honest debate on our changing climate, the role of human activity, our ability to measure the degree and extent of human activity, and what to do about it. 6.Do you accept the science of ocean acidification that has directly connected the increase in human-caused carbon dioxide emissions with decreases in ocean pH? First, I would note that the oceans are alkaline and are projected to remain so. Second, it is my understanding that the degree of alkalinity in the ocean is highly variable and therefore it is difficult to attribute that variability to any single cause. 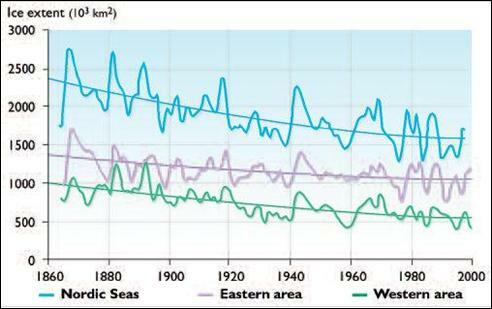 7.Do you accept that the oceans are currently acidifying at a rate unprecedented in tens of millions of years? First, I would note that the oceans are alkaline and are projected to remain so. Second, it is my understanding that the degree of alkalinity in the ocean is highly variable and therefore it is difficult to attribute that variability to any single cause. I am unaware of tens of millions of years of data on the pH of oceans. 11.Both states and some Members of Congress have for years criticized EPA for “one-size-fits-all approaches” and failing to give adequate flexibility to states. Yet in challenging EPA’s Clean Power Plan, you attacked EPA for just that – giving states and regions too much latitude in administering the Clean Air Act. Wouldn’t that take the Agency in the wrong direction? I, along with the Supreme Court, which issued a stay against the Clean Power Plan in February 2016, believe the EPA exceeded the bounds of authority established by Congress in the Clean Air Act. In particular, the Rule attempted to supplant decisions traditionally preserved for the states, including the establishment of intrastate energy policies, for agency mandated alternatives that would have increased the price of electricity for local citizens and reduced reliability. The notion of flexibility in the Clean Power Plan was conceptual at best. If confirmed, I will work to achieve the objectives of EPA-administered laws consistent with the process and framework established by Congress abiding by the bedrock principle of cooperative federalism, which relies on meaningful collaboration between the EPA and the states to achieve important environmental objectives. 13.In 2014, four Republican former EPA Administrators – Bill Reilly, Bill Ruckelshaus, Lee Thomas, Governor Christine Todd Whitman – testified before EPW that climate change is real, EPA regulations do not end up costing as much as industry initially estimates, and EPA has clear authority under the Clean Air Act to curb carbon pollution. In a 2015 interview with Climate Progress, Governor Whitman said: “The idea the EPA is a job killer is false” and with regard to the Clean Power Plan “what EPA did was to allow as much flexibility as frankly I’ve ever seen them be able to create in a regulation.” Do you think that the former Administrators are correct in their assessment that regulations do not cost as much as industry initially estimates? If not, can you explain why not? I am not sure what specific regulations the former EPA Administrators were referring to and accordingly lack sufficient information to answer the specific question. Generally speaking, if confirmed, I will work to ensure that EPA regulatory actions accurately account for the costs and benefits across all impacted stakeholders. 14.Carbon Capture Utilization and Storage is a bipartisan policy area that I am working on with my Republican colleagues. Senator Graham and I visited the world’s first Carbon Capture project in Canada that has been operational since 2014. In 2016, SaskPower successfully captured and injected 800,000 metric tons of carbon dioxide and the facility has operated nearly 85 percent of the time. Recently, Petra Nova in Texas became the first United States first post-combustion carbon capture project to begin operation. SaskPower and Petra Nova are listed in the Clean Power Plan as viable options for helping states reach their Clean Power Plan targets. Do you believe that CCUS is a viable technology for reducing emissions from power plants? I believe CCUS technology can play an important role in the development of our future coal fleet, however it is not yet a viable option. Both the SaskPower and Petra Nova plants referenced in your question relied on significant support from their respective governments to become operational. Forcing private businesses to use unproven, expensive technology would be unfair, which is why Congress provided for protections against the EPA embracing such a practice in the Energy Policy Act of 2005. 18.According to the Wind Energy Association and Solar Energy Industries Association, in 2016 the United States had 400,000 wind and solar jobs–310,000 solar, 88,000 wind. In contrast, according to 2016 DOE Energy Employment Report, employment in oil and gas extraction was 388,000 and 53,000 in coal mining. The Energy Information Administration (EIA) just found that coal production continued to decline in 2016 down nearly 17% from 2015 production. Its Annual Energy Outlook in 2017 reports that declining cost of natural gas is still encouraging utilities to shift away from coal over the long-term. The change is expected under our existing policies regardless of the Clean Power Plan. Do you believe that dismantling the Clean Power Plan and cutting back on environmental regulations will bring back the coal industry? Specifically, will it bring back coal jobs and make coal the dominate source of electricity in the U.S. again? I am unable to say whether United States utilities and electric cooperatives would or would not return to coal as a predominant portion of their fuel mix if the Clean Power Plan were revoked or other regulations were cut back. The federal Energy Information Administration projects that coal will be an important part of the American fuel mix for the foreseeable future. 20.Improved environmental quality and economic growth aren’t mutually exclusive. Since 2009, the states participating in the Regional Greenhouse Gas Initiative (RGGI) have seen carbon pollution fall by 18% while their economies grew by 9.2%. Emissions in the other 41 states fell by 4% while their economies grew by 8.8%. Do you agree that RGGI has developed a successful model for growing our states’ economies and cutting carbon pollution at the same time? Will you commit to maintaining funding levels for EPA grant programs that fund state level initiatives to reduce their emissions? While the agreement between the states participating in RGGI appears to be successful, what works for the Northeast may not achieve the same success in, for example, the Southwest. If confirmed, I look forward to working with EPA’s budget staff and program offices to develop a budget focused on protecting human health and the environment for all populations. I will work to ensure that the limited resources appropriated to EPA by Congress are managed wisely in pursuit of that important mission and in accordance with all applicable legal authorities. 32.The State Department and others have assessed life-cycle emissions for various crude oils and found tar sands crude is one of the dirtiest crudes on the planet from a GHG perspective. Do you agree tar sands crude has significantly higher life-cycle emissions than Oklahoma Sweet and most other crude oils? The lifetime emissions of any energy source should be considered in the context of necessary extraction techniques as well as transportation of the fuel, among other issues. For example, transporting crude via pipeline clearly creates fewer emissions than transporting it via other sources in terms of fossil fuel energy. Without knowing the specifics of all of these factors in a given instance, it is difficult to identify which sources may result in greater emissions. 35.The State Department found that the emissions associated with the production, refining and combustion of the tar sands in Keystone XL would result in 147 to 168 million metric tons (MMT) CO2e per year (equivalent to the emissions from as many as 35.5 million cars). The State Department also found that by displacing conventional crude with dirtier tar sands, the project would result in 1.3 – 27.4 MMT CO2e of additional emissions (equivalent to the emissions from as many as 5.7 million cars). Do you agree? If you disagree, please identify any research studies or experts you have consulted to form your opinion. I am familiar with multiple State Department determinations that the Keystone XL pipeline would not significantly impact climate change. 36.In a recent study, the National Academy of Sciences (NAS) concluded that diluted bitumen—the type of crude that would be primarily transported by Keystone XL—has a series of properties that, taken together, make tar sands spills of greater concern for spill responders than spills of other, commonly transported crude oils. Both EPA and the Coast Guard advised the scientists on the NAS committee. Do you agree with their conclusion that tar sands spills pose greater risks and challenges for spill responders than other crude oil spills? If you disagree, please identify any research studies or experts you have consulted to form your opinion. Diluted bitumen has been transported safely by pipeline in the United States for more than 40 years. It is my understanding that he NAS report did not infer that the Keystone XL pipeline posed significant concerns or that diluted bitumen could not be safely transported via pipelines or other forms of transportation. 42.Based on the climate change implications, spill potential, and other factors, the Obama Administration determined Keystone XL isn’t in our nation’s best interest. Do you agree? If not, why? While the Obama Administration failed to grant the cross-border permit required to complete the Keystone XL pipeline, much of the pipeline was built in accordance with applicable laws and permits both federal and state. A large portion of the Keystone XL pipeline safely operates through Oklahoma and I believe that safely and efficiently moving natural resources through the country is very important. This is the closest thing to a debate on climate change since 2008. Debates stopped when alarmists discovered audiences came away more skeptical from the experience. These hearings are not really a fair and open discussion of the topic, since the Senators have nothing to lose while the Nominee faces rejection. Climate change was brought to the attention of policy-makers by scientists. From the outset, these scientists also brought their preferred solutions to the table in US Congressional hearings and other policy forums, all bundled. The proposition that ‘science’ somehow dictated particular policy responses, encouraged –indeed instructed – those who found those particular strategies unattractive to argue about the science. So, a distinctive characteristic of the climate change debate has been of scientists claiming with the authority of their position that their results dictated particular policies; of policy makers claiming that their preferred choices were dictated by science, and both acting as if ‘science’ and ‘policy’ were simply and rigidly linked as if it were a matter of escaping from the path of an oncoming tornado. The Senate hearings show that nothing has changed. Leftist politicians invest into their climate beliefs way more certainty than the facts support. They quote from the IPCC as though presenting Scriptural references. Even the Bible is invoked in support of their environmentalist agenda. They seem unable to process new information this century casting doubt upon their assumptions. In the face of this, it is good to see Scott Pruitt maintaining his balance and moving ahead. Many of his responses would win debating points in an open dialogue. Pruitt was once owner and general manager of the Oklahoma Redhawks, a AAA professional baseball team. Maybe he has some Chickasaw blood in his veins equipping him to be such a Brave running this gauntlet. Vessels Kapitan Dranitsyn and Admiral Makarov ‘marooned’ in east for the rest of winter after getting trapped off Chukotka. 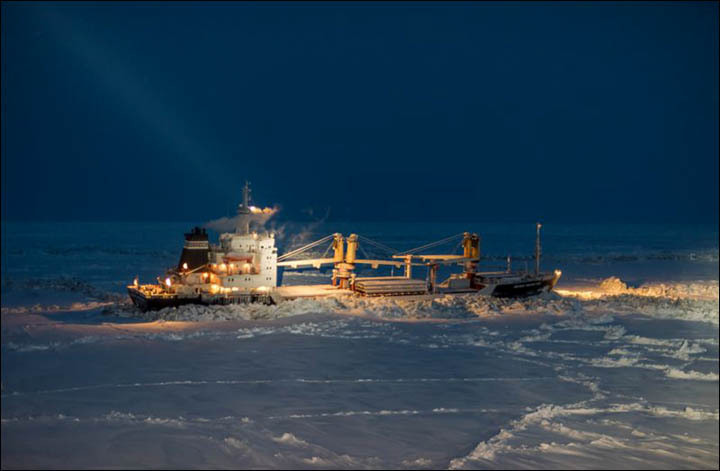 In the first such crossing since Soviet times, the convoy had earlier delivered supplies for the world’s first floating heat and power plant to be assembled in Chukotka, Russia’s most easternmost region, after a successful journey from Arkhangelsk to Pevek lasting from 14 December to 7 January. But, despite significant temperature rises across the northern latitudes in recent years, the vessels became quickly stuck in thick, compressed ice on their return journey. Initially there were hopes that the icebreakers could force their way out and continue their voyage within a week, and aerial reconnaissance was deployed in a search routes from the ice clog. They are currently trapped by sudden thick ice around Chukotka’s northernmost cape Shelagsky, some 24 nautical miles from Pevek, in some of Russia’s most exposed waters. Ruslan Nazarov, chief of Chukotka’s emergencies service, said: ‘The ice around Cape Shelagsky is at 10 points. The ice fields are more than one metre thick. The ice compression is strong and hummocks are higher than 2.5 metres. A spokesman for Rosmorport has announced the icebreakers will delay a return until probably May or early June. ‘The vessels will remain for the winter because of the very heavy severe ice conditions,’ he said. 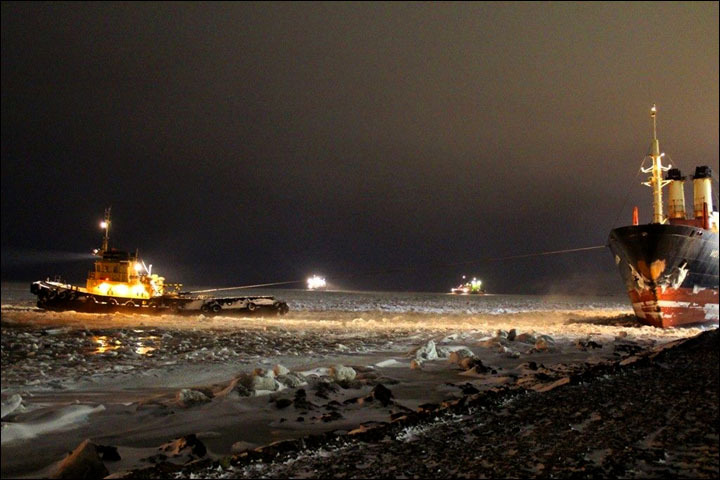 All the vessel got out of the ice, and three of them – Captain Dranitsyn and the two cargo ships – returned to Pevek. The Admiral Makarov moved further east to continue working for Rosmorport in clearing sea routes. Officials said the icebreakers could have gone further through the ice but there was ‘a very high risk of significant damage’ to the supply ships, and it was decided to postpone the return to Archangelsk. After a slow recovery in October and December, ice extent has picked considerably in recent weeks. The graph shows how 2017 has surged to approach 2016 and the 11-year average, while exceeding 2006 (the decadal low year) by almost 500k km2. Sea Ice Index (SII satellite product) lags behind by more than 300k km2, as it has throughout January. The table shows ice extents across the seas within the Arctic area. On the Russsian side, Chukchi through Laptev are all at maximums, as evidenced in the reports from the Siberian Times. Kara is also now average and well ahead of 2006. Barents continues to be in deficit to average, but in surplus to 2006. On the Canadian side, all seas are above average, with Greenland and Baffin well into surpluses. The main difference between 2017 and the average is Bering Sea down by 200k km2. Bering Sea is the only place with less 2017 ice than 2006. On the other hand, Okhotsk is 200k km2 above average and 400k km2 above 2006. 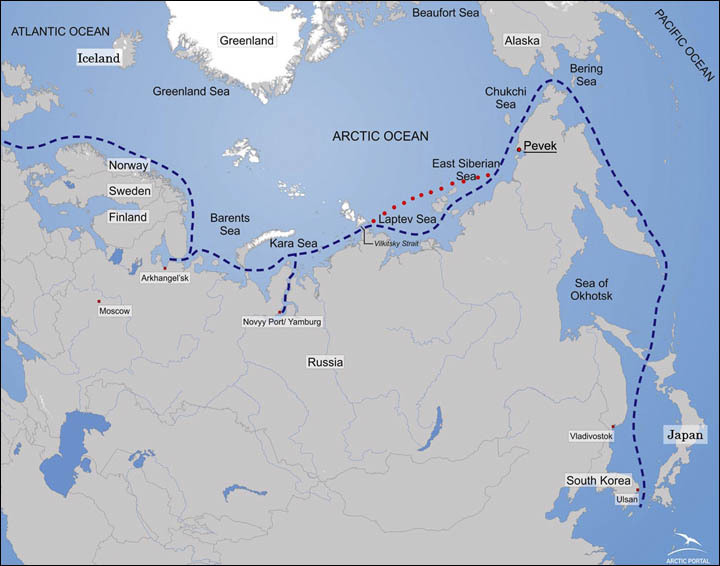 But the saga shows that despite all the talk of climate change and warming in the Arctic, thick ice can prevent convoys from crossing the Northern Sea Route in deep winter. Since the US election “identity politics” have been on full display. It actually goes beyond politics in the sense that social media has brought us a global culture where who you are matters while what you accomplish does not. We have had many celebrities like Paris Hilton who are famous for being famous. Political activity or movements based on or catering to the cultural, ethnic, gender, racial, religious, or social interests that characterize a group identity. Thus in the last US election, Hillary’s slogan was “I’m with her.” And when she lost, women took to the streets in protest, believing that their gender lost. And in their shock and dismay, cyberspace is overwhelmed with messages reminding people that Trump is not “one of us.” Sadly, that refusal to identify with the victor and now President extends to his wife and children as well. Unsurprisingly, for two months before taking office, Trump was criticized for things people imagined he would do once in power. And that goes to the core of identity politics. A subgroup, be they Hispanic, or LGBT, expects that one of their own should be in office, ensuring protection of their group’s interests. The reality is, elected officials do not become competent due to an identity. Moreover, people belong to many groups, and each person has their own mix of opinions and interests. The US used to be a merit-based society, where people were recognized and rewarded for their achievements, not simply for their style. But recently it is more about style, not substance. Thus the Nobel Peace Prize was awarded to Obama, not for achieving peace, but for getting elected US President while being black/white, Christian/Muslim. I liked Obama, and thought he kept his cool guiding the US out of the 2008 financial crisis. He was re-elected not so much on identity as on achievements, referred to in his 2012 campaign slogan: “Bin Laden is dead, General Motors is alive.” Unfortunately, in his second term, he went off the rails on climate change, seeking to be a hero in the eyes of environmentalists, a key liberal identity group. Hillary promised more of the same, and that is why people voted against her or abstained. After watching President Trump’s inauguration speech, I am guessing he is already thinking beyond draining the swamp. The federal bureaucracy is immense and set in its ways. 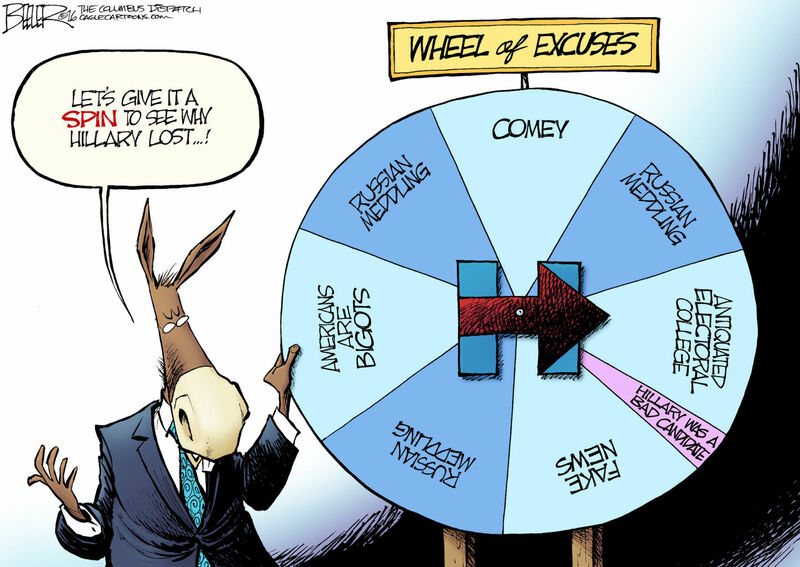 Like a donkey, it digs in its heels and refuses to cooperate. Trump knows his presidency is an hostile takeover, not the first one in his business experience. We see lots of push back from climate alarmist senators in the confirmation hearings, a torrent of trashtalking posts from Podesta’s blogs, internet sales of “Resist” T-shirts, scaremongering by journalists, along with street protests, defiant celebrities and fearful outbursts from government employees. He seems to be getting their attention. 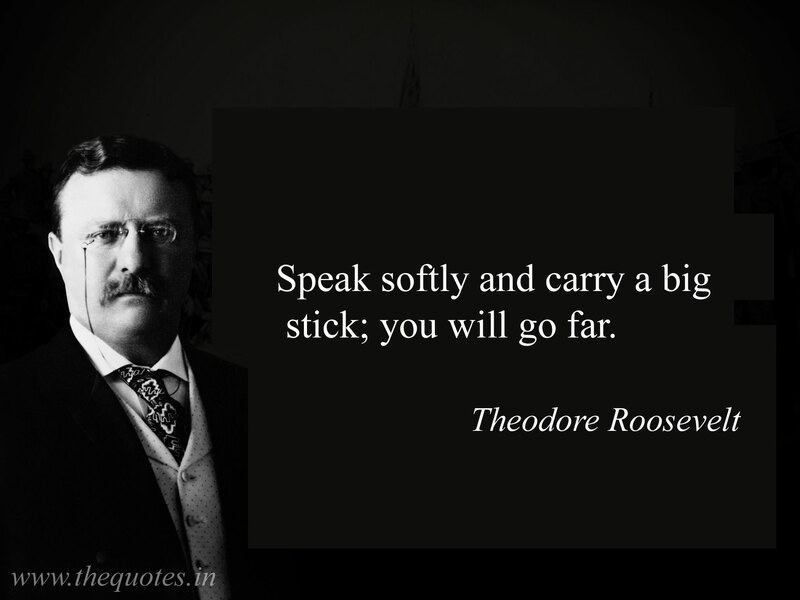 Let’s see how well Trump follows the advice of Teddy Roosevelt. 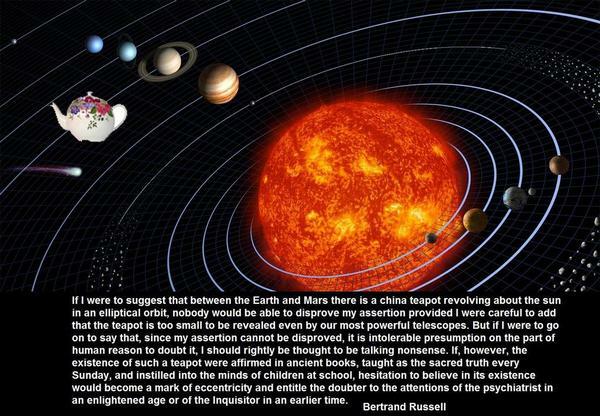 The confirmation hearings with questions from global warming zealots reminded me of Bertrand Russell’s teapot analogy. To enlarge, open image in new tab. The notion of global warming/climate change resembles closely that mythical teapot. 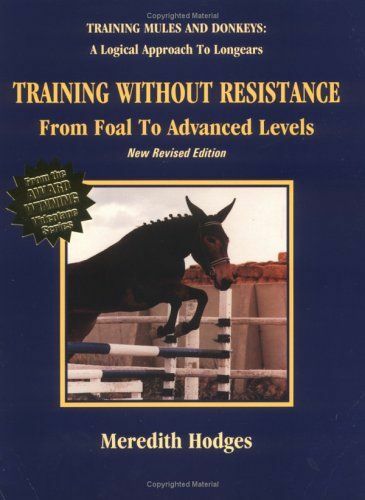 People like Lewandowsky and Oreskes psychoanalyze unbelievers. And public hearings are conducted to uncover unseemly heresy inside political appointees. At least when religion is recognized as such, and not confused with science, modern societies understand it is a matter of opinion and freedom of thought and expression is accepted. We are seeing lots of claims about the temperature records for 2016 and 2015 proving dangerous man made warming. At least one senator stated that in a confirmation hearing. Now that HadSST3 data is complete for last year, let’s see how obvious is the ocean’s governing of global average temperatures. 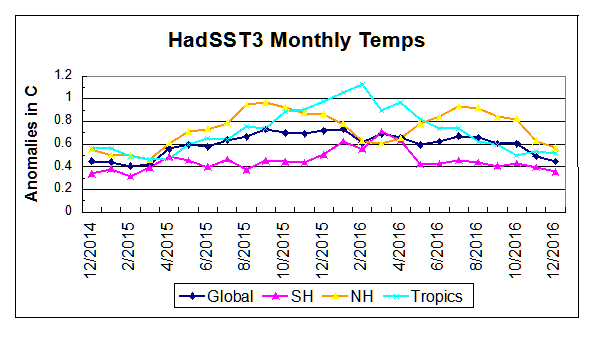 The chart below shows the last two years of SST monthly anomalies as reported in HadSST3. Note that higher temps in 2015 and 2016 are first of all due to a sharp rise in Tropical SST, beginning in March 2015, peaking in January 2016, and steadily declining back to its beginning level. Secondly, the Northern Hemisphere added two bumps on the shoulders of Tropical warming, with peaks in August of each year. Also, note that the global release of heat was not dramatic, due to the Southern Hemisphere offsetting the Northern one. Finally, the oceans are entering 2017 at the same temperature level as 2015, only now with downward momentum. 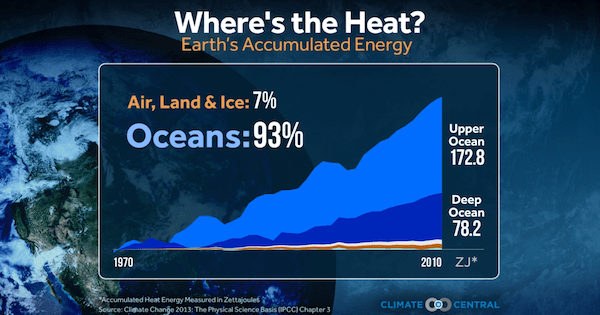 Much ado will be made of this warming, including claims of human causation, despite the obvious oceanic origin. However, it is unreasonable to claim CO2 functions as a global warming agent, yet the two hemispheres respond so differently. Moreover, CO2 warming theory expects greater warming in the higher latitudes, while this event was driven by heating in the Tropics, contradicting alarmist warming theory. More from true believers in climatism during today’s Senate confirmation hearings, featuring Bernie Sanders and Ed Markey. Ryan Zinke, nominee for Secretary of the Interior appeared before the Senate Energy and Natural Resources Committee for his confirmation hearing Tuesday. Is President Elect Trump right? Is climate change a hoax? First of all, the climate is changing. That’s indisputable. Secondly, man is having an influence. I think the debate is about what is that influence, and what can we do about it. If confirmed I will inherit the USGS, where there are a lot of great scientists. I am not a climate scientist, but I will become a lot more familiar with it, and it will be based on objective science. I don’t believe it is a hoax. I believe we should be prudent, I don’t know definitively. There is a lot of debate on both sides of the aisle. Actually, there is not a whole lot of debate now, the scientific community is virtually unanimous that climate change is real and causing devastating problems. There is a debate within this committee, but not in the scientific community. If climate change is already causing devastating problems, should we be drilling for fossil fuels on public lands? We need an economy and jobs too. I support an “all of the above” approach to energy sources. I think that is the better way forward. Scott Pruitt Nominee for Director of EPA appeared before the Senate Committee on Environment and Public Works. NOAA, NASA have declared that 2016 is the hottest year in the 137 year record that has been kept. Donald Trump has said that global warming is a hoax caused by the Chinese. Do you agree that global warming is a hoax? Nominee Scott Pruitt: I do not, Senator. Senator Markey: So, Donald Trump is wrong. Nominee Pruitt: I do not believe climate change is a hoax. Senator Markey: OK, I think that is important for the President to hear. As I said in my opening statement, the climate is changing and human activity contributes to that in some manner. 97% of the scientists who publish in this field believe that human activity is the fundamental reason we see climate change. Do you disagree with that? I believe that the ability to measure with precision the degree of human activity to impact the climate is subject to more debate on whether the climate is changing and whether the human activity contributes to it. While you are uncertain, the vast majority of scientists are telling us, if we do not get our act together, and transform our energy system away from fossil fuel, there is a real question as to the quality of the planet we will be leaving to our children and our grandchildren. The overwhelming majority of scientists say we have to act boldly, and you are saying more debate is needed on this issue, and we should not be acting boldly. No Senator, as I said the climate is changing. Why do you think the climate is changing? In response to the CO2 issue, the EPA administrator is constrained by statutes passed by this body. I am asking for your personal opinion. My personal opinion is immaterial. Really. You’re going to be the head of the agency to protect the environment, and your personal feelings about whether climate change is caused by human activity and carbon emissions is immaterial? Senator, I have acknowledged to you that human activity impacts on the climate. The scientific community doesn’t tell us that it impacts, they say human activity is the cause of climate change and we have to transform our energy system. Do you believe we have to transform our energy system in order to protect the planet for future generations? I believe the EPA has a very important role in regulating emissions. The whole emphasis on 97%, vast, or overwhelming majority is to distract you from the fact that these are opinions. Neither scientists nor senators know the future, since we lack sufficient knowledge of the climate system to predict its behavior. No one knows as a matter of fact whether additional CO2 will result in warmer or cooler temperatures, or make any noticeable difference at all. It is also anyone’s guess what we can do today to ensure desirable temperatures in the future. If we had the power to determine future temperatures, opinions vary as to what temperature level would be ideal for everyone living around the world at different latitudes. It is hubris to think that government can control the weather and climate. (King Canute, where are you when you are so needed?) Wise political leaders would realize that there will likely be future periods both colder and warmer than the present. They would also recognize that cold is the greater threat to human health and prosperity. Planning for future climates focuses resources on two priorities: Robust infrastructures and reliable affordable energy.